After reading this great interview on Design*Sponge about the founder of ModCloth, in which she links an essay about doing what you love, I found myself pleased to be doing what I am doing - because I love it, and because even though it is work, it never feels like work. It just feels like happy. So why do I sell vintage? 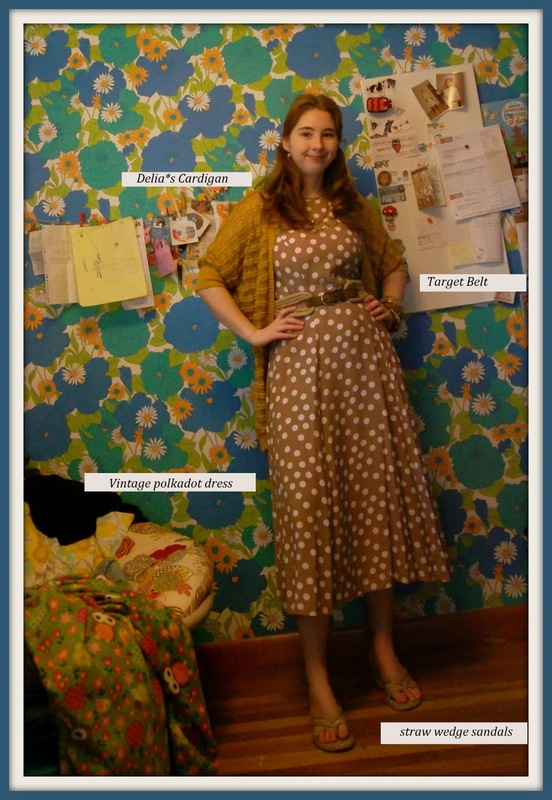 What made me choose the vintage and handmade life? As a kid, my family didn't have a ton of money. So we were always shopping sales, and it instilled in me a sense of value that I've never forgotten. We didn't thrift, and we didn't do a lot of yard-sale shopping except for in a fun sense, but I hit a point in my teens where I started thrifting and loved what I found. Vintage sun dresses and quirky t-shirts, flower-power housewares and just fun things to brighten life. So the thrill of the hunt began with finding something right up my alley. It all went into hibernation in my college years, as my focus was spent more on academics than any extra curricular activities, and finally came blossoming back when I moved to New England to settle into a new life with my (now) husband and moved into a mid-century home. Now, I am in love with finding vintage, but not just finding vintage but also giving it a new life. When I pick something out at the thrift store, I am not just saying "that is cool, I think it could make me some money." There's more to selling vintage than trying to make a living - and that's a passion for finding things a new home where they will be loved. At some point in time, that garment or item was loved and used and, though often lost, there is a story behind each item. My goal is to give that garment a NEW story. What made it catch my eye? The design? The age? The craftsmanship? Can I tell if it has a story behind it? Is there something about the item that tells me about the previous owner? An old dry-cleaning tag, a name written in the collar, something in the pocket? Does it fit into today's world? Is it still fashionable and will someone be able to pop it into their wardrobe and wear it with other pieces they have? Is it unique, or classic, or on trend? Does it make a statement? Will I be able to find it a new home? Will someone love it once again? Am I buying it at a price where I can make sure my customers are getting a good value? If I think I can bring the garment back to life and put it back in someone's closet then it goes in my cart. I take it home and care for it - often cleaning it and removing stains or repairing it. Then it gets lovingly photographed and measured, and listed for someone to find. And it makes me so very happy to sell something, because it means that someone is going to wear it and it will once again have a place in the fashionable world. And if it's a housewares item that's great too, because now someone will see it and use it and once again get enjoyment and function out of something that could otherwise be thrown out. If we're not careful, and if some of us aren't out there salvaging the beautiful things of the world, the goodies of times past will be lost to us forever. It takes vintage sellers to pull the beautiful out of the piles of "stuff" and put it into your hands. And that's why I sell vintage.